Chafor’s hardware shop is a Crowle institution. The shop is like an Alladin’s cavern of useful items that are hard to find elsewhere and if they haven’t got what you are looking for they’ll do their best to get it for you. In this day of internet shopping, it is a breath of fresh air. Although the Chafor family have only been running the shop for a little over fifty years the shop has been an ironmonger’s shop for more than 150years! 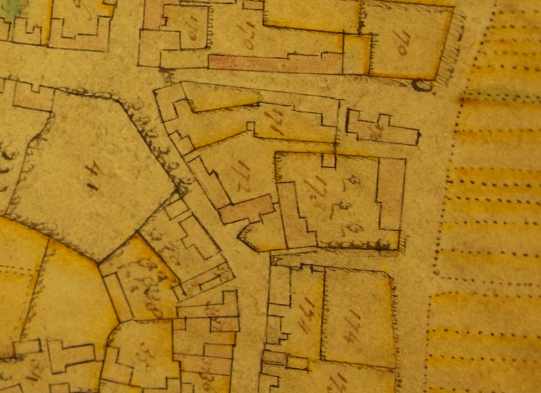 Detail from the 1738 Manorial plan showing Chafor’s Shop site. The Terrier lists 172 as being owned by Edmund Maw junior and is described as a messuage house homestead and garden with an area of 32perches. The property was held as copyhold. The survey took place as a result of the 1909-1910 Finance Act which provided for the levy and collection of duty on land in the United Kingdom based on any increased value of the land as a result of public money spent on communal infrastructure – a so-called ‘increment value duty’. These records give useful details on the owners and occupiers of property. The report from the 1911 Tax Return shows that the Shop was owned by Miss Gertrude Pheasant (confirming that George Pheasant did live in this particular property) and the occupier is stated as ‘Batty Jno E now Donald’. The rent is given as £50 per annum. Ironmonger’s shop, warehouse, workshop & good house in Crowle. Excellent corner site. Roof of house & shop in bad order workshop needs attention. Good garden at back. Brick & tile. Front shop, Back shop, 2 rooms, kitchen warehouse and showroom over. 3 bedrooms and box room. Brick & slate. Stores, wash house. Workshop over. Using trade directories and census returns we can identify who was occupying the shop. 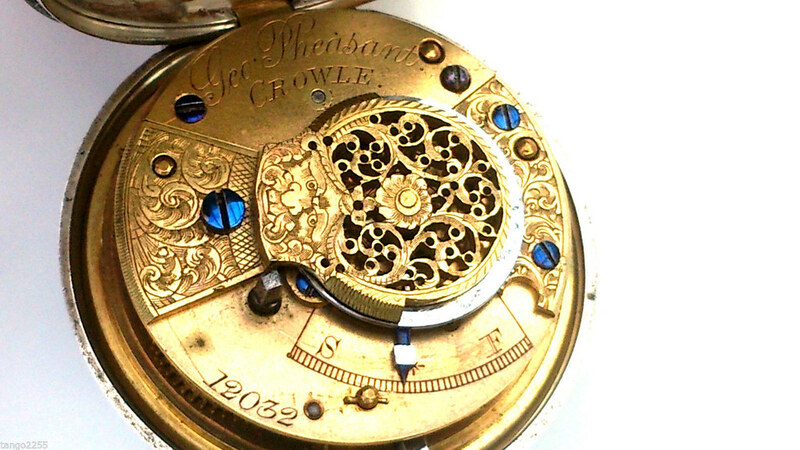 A watch made by George Pheasant in Crowle. In the 1841 census he is shown as living near Snaith at Hirst Courtney and his profession is given as Gun Smiths Apprentice. By the 1851 census he is living with his wife Sarah, who was born in Crowle, and his profession is gunmaker – difficult to say for definite whether he is already living in the building that was to become Chafor’s. In the 1861 census he is described as an Ironmonger and is living with his wife and three children Alfred, Charles & Annie. The position in the census is in close proximity to The George & Dragon (landlord George Pidd) so I feel it is likely this would be in the shop that was to become Chafor’s. Possibly his change in his reported profession was because he had taken over an ironmonger’s shop – but this is just conjecture. In the 1871 census he is described as an Ironmonger with 6 men. He is living with his wife and three children Charles, Annie and Emily. Again because of the proximity to the George & Dragon I am fairly confident that he is living in the property that was to become Chafer’s. In the 1881 census he is described as an Ironmonger and is living with his wife, and two daughters. The road is Market Street, which appears to have been the name given to the bit of the high street between the Market Place and Church Street. Again the entry is in close proximity to the entry for the George & Dragon. 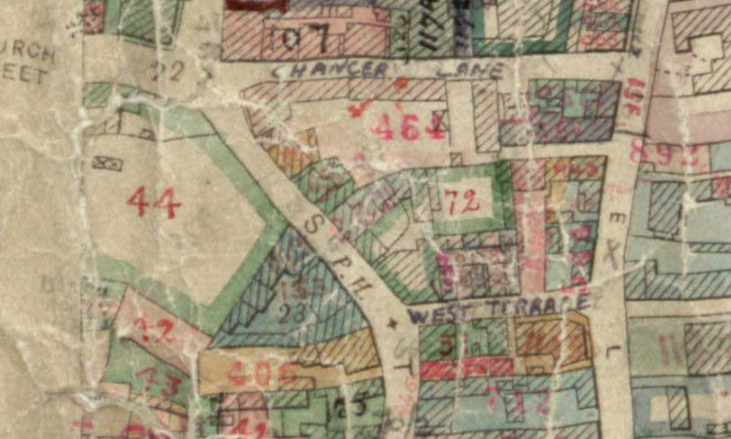 In the 1891 Return it is clear that George Pheasant Ironmonger is occupying the property adjacent to West Terrace, indeed West Terrace has been given the name Pheasant Lane in brackets. George Pheasant’s entry in the 1891 census. In the 1901 census at the age of 81 he is described as a retired ironmonger and is living in the Market Place with his wife and two of his grandchildren. He died on the 29th November 1905. The fact that in some of the trade directory entries the address is given as Market Place is not a concern as it appeared they included properties near the Market place. Although born in Bradford he moved to Glossop and then the Isle of Man before coming to Crowle. In 1861 he is described as a Tinplate worker, in 1871 he is described as a Tinplate worker and gas fitter, in 1881 after moving to the Isle of Man hes is described as a Master Ironmonger. He had 6 children with his first wife, Ruth, before being widowed. He married his second wife Mary who came from the Isle of Man. The 1901 Census shows John Edward Batty living in Crowle with his wife Mary, and he described as an Ironmonger. He is clearly living at what is now Chafor’s shop. The 1911 Census shows John Edward Batty still described as an Ironmonger living with his wife in the same location. He died in in 1914 on the Isle of Man. Alex J Donald 1911- ? Key & Sons ? – ? In the 1940’s and 50’s the shop was being run by Earnest and Rosie Henning, although the appeared to keep the Key & Sons Name. Brian Chafor purchased the shop in 1963 from Sun Engineering, wh owned it at the time. 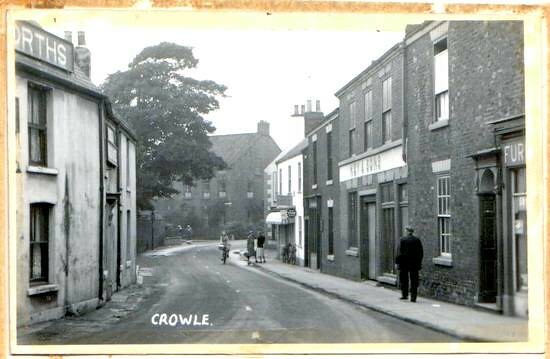 The shop is still run by the Chafor family and is a Crowle institution.